Gold frame, the reverse with panel glazed to reveal plaited hair. Samuel Shelley followed a conventional route into his chosen career but later diversified from the traditional portrait miniature. After studying at the R.A. schools from 1774 (and exhibiting 1774-1804), he became an important voice in the history of watercolour painting in the eighteenth century. A founder member of the first watercolour society in 1805, he believed that watercolours should be given their own forum and exhibition space in order to be properly appreciated. Before the formation of such a society, watercolours could only be shown next to oils at the conventional exhibition spaces of the Society of Artists or Royal Academy. This new separation from brightly coloured, large oil paintings allowed watercolours to be viewed among paintings in the same media and heralded a new admiration of such work. Shelley’s desire to compete with oil paintings also led him to produce small watercolour subject pictures to exhibit alongside the portrait miniatures he painted all his life. 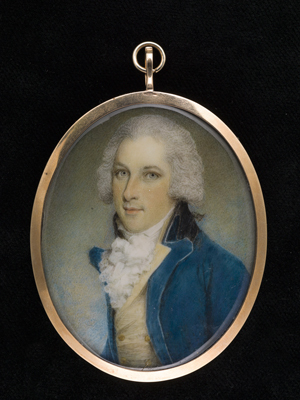 This portrait of a young man was probably painted in the late 1790s when Shelley was establishing himself as a fashionable miniaturist. His work was compared to the great names of the period, as evidenced in a letter to his brother from the young miniaturist Andrew Robertson in 1802. He said that the portrait painter Martin Archer Shee had that if he (Robertson) pursued his ambition he would exceed Cosway and Shelley as an artist. Shelley worked at the court, although he never attained an official position there. He was most financially successful with his portrait miniatures and sold far fewer of his small subject pictures. He lived in London all his life, dying at his home in Hanover Square in 1808.